I went into Will Haunt You nearly blind. I didn’t know anything about the plot, or really what to expect. After hearing some excellent early praise for Brian Kirk’s new novel, I decided to read the prequel, OBSIDEO (more on that later). After I got through the first couple of chapters, I thought I knew where I was headed. Something strange, something violent. Perhaps a mix between Bentley Little and Brian Keene? But while Will Haunt You does sit at the table with Little and Keene, this isn’t a reheated narrative. It’s heart-breaking and visceral, while also bringing its own brand of dark humor. It’s a horror novel that wears its ingenuity and wit on its bloody sleeves. This book focuses on aging rocker Jesse Wheeler. After reading a book given to him by a fellow band member, Jesse is dragged into what turns out to be the worst kind of nightmare. He’s chased, tortured, and forced to confront his demons in life. His tormentors are cruel and seemingly omnipotent. Will Haunt You plays with perception and conspiracy in a way that I rarely see. I had a blast reading through this. It certainly helps that Jesse is an excellent character to travel with. He’s both wry and realistic, with just the right amount of self-deprecation. His actions are largely driven by his wife and son, who play major parts in Jesse’s hellish journey. But while I think Jesse is great, he’s not the true star of the show. I want to avoid dragging you further into Spoiler Town, but I will say that the antagonistic force of Will Haunt You is utterly terrifying. This haunting takes on many forms, and I enjoyed all of them. The horror of this book is bizarre and feels like something that came dripping out of a monster’s fever dream. A great horror novel often earns its crown through its set pieces, and Brian delivers them in spades. I had no idea what would be waiting for Jesse around each corner. Each new location brought out a fresh bout of anxiety for me. Who can be trusted? What form will the next torment take? 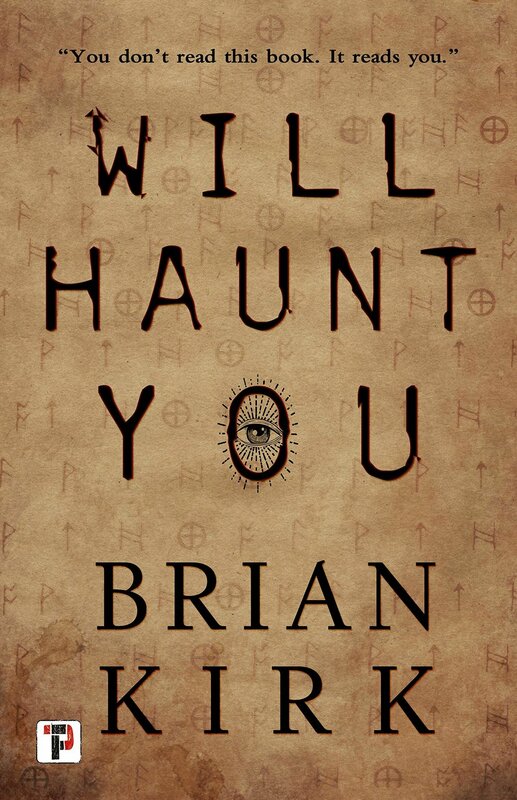 As a Bizarro horror novel, Will Haunt You really works. It’s inventive, emotional, and harrowing. The central thrust of the book makes for thoroughly engrossing reading. Some writers have trouble making their strange happenings believable, but Brian Kirk is certainly not one of them. The only real gripe I had was that the ending, which didn’t quite coalesce for me. It wrapped up too quickly, leaving me a bit confused. It’s not a deal breaker by any means, but that’s a testament to how excellent the rest of the book is. Also: Brian Kirk wrote a short companion piece called OBSIDEO. It’s a potent piece of Creepypasta that is the perfect introduction to the book that follows. Seek it out, and heed the warnings inside. Trust me. Would I lead you astray?